In the UK the switching on of Christmas lights is usually a big event with a local celebrity involved. 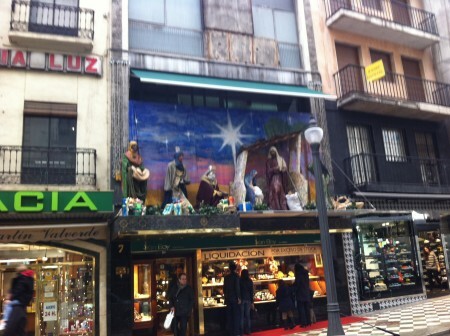 In Granada the Nativity Scene is the main feature in most shop windows and large buildings. Christmas trees are few and far between. Last year in the official competition 35 Nativity scenes participated. (there are more thant don´t compete) the first prize is 5000 euros. 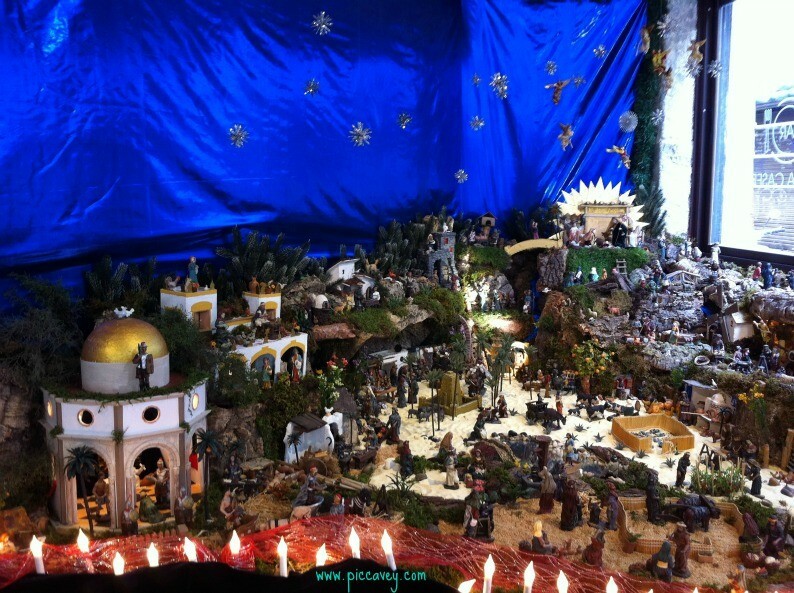 Every year in Granada there are many different Nativity Scenes to visit. Here are some of the main ones. In Spanish it´s called the Ruta de Belenes. Ayuntamiento – Granada Town Hall. (photo above) This is inside in the patio. (Address: Plaza del Carmen) Open from 10am-2pm & 5pm-9pm until 5th January. Angel Custodio at San Anton 38 from 6pm-9pm. Holidays open from 11.30-2pm. Sale of traditional sweets too. For more traditional sweets made in the local Convents of Granada check out this list: Reposteria Conventual For many convents it´s a main source of income for the year. 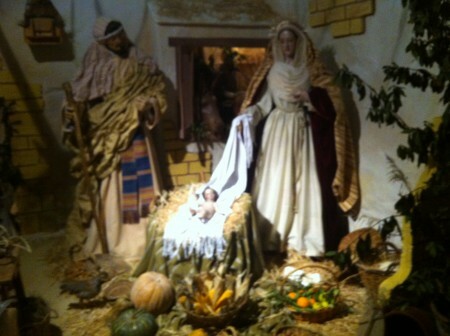 In the Albaicin at Calle Zafra from 11am-2pm until 6th Janaury the Nativity scene has the Alhambra included. Convent of the Carmelitas Descalzas at Plaza San Juan de la Cruz (just off Pavaneras) 6th to 19th December open evenings from 5.30pm-8.30pm and then from 20th December open mornings 11am-1.30pm and evening 5.30pm-8.30pm. Huetor Tajar the nativity scene is set up at Plaza Gregorio Pelaez. Open from 5pm-9pm. Almeria In the Rambla 70 stalls in the Christmas market open 10am until 11pm. 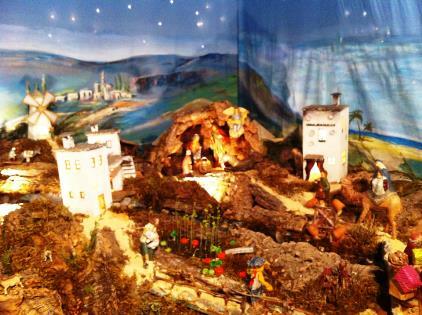 The Official Nativity scene is at the Plaza Vieja until 6th January 2014. Wherever you are this Christmastime – Have fun! 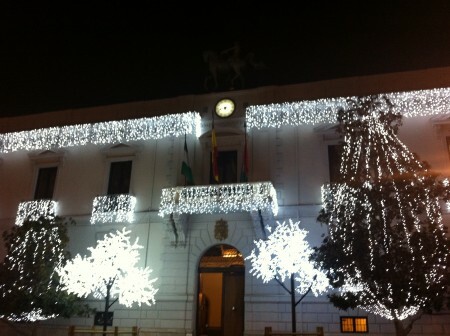 I always love to see the Belenes around Spain when it´s Christmastime. So much care & tradition goes into it. My favourite ones are those that have day & night lighting changes. Some beautiful-looking nativity scenes, Molly. Not sure they can top the Belén on Las Palmas’ Canteras beach, though. Must try GC for Christmas sometime! What a nice surprise to find this delicate corner dedicated to spreading spanish culture among the English-speaking!